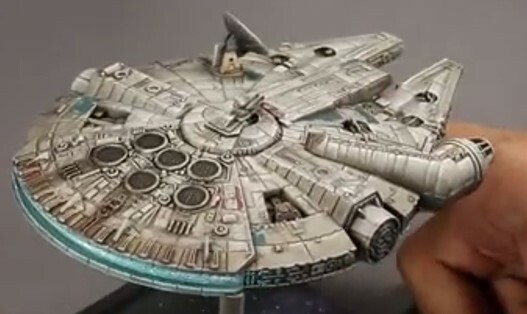 El canal de Painting Buddha nos muestran siete vídeos sobre la pintura del Millennium Falcon para X-Wing. En resultado final es impresionante y el detalle de decoración de la pena lo hacen aún más. Star Wars X-Wing: Millennium Falcon Re-Paint - Episode 1 - "It's a Wash"
Star Wars X-Wing: Millennium Falcon Re-Paint - Episode 2 - "Game of Drones"
Star Wars X-Wing: Millennium Falcon Re-Paint - Episode 3 - "Attack of the Crowes"
Star Wars X-Wing: Millennium Falcon Re-Paint - Episode 4 - "The Bendom Menace"
Star Wars X-Wing: Millennium Falcon Re-Paint - Episode 5 - "The Benpire Strikes Back"
Star Wars X-Wing: Millennium Falcon Re-Paint - Episode 6 - "The Return of the Jack"
Star Wars X-Wing: Millennium Falcon Re-Paint - Episode VII - "The Force Awakens"